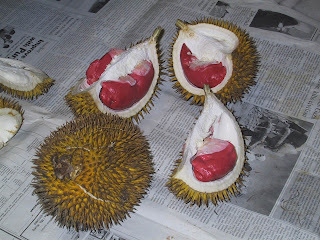 On Sunday, I was really craving some more durian. I was assuming that I didnt have many days left here, so I thought my days of fresh durian were sadly numbered. What really gets me is that they eat all this fried pork and rice and all this other garbage and then eat the durian. I feel like the durian is wasted on them because they are eating all this trash that is canceling out the magic of the fresh durian. So...my limit to spend was $100 HK Dollars, which is about $12-13 US. He says that its ripe, but not fully, he then weighs it and it comes out to $140 HK Dollars. That comes to about $18 for a Durian. OUCH. I had to apologize and walk away feeling pretty embarrassed. I guess I won't be going back there anytime soon. We find another guy selling some, but his are called "Golden Pillow Durian". Never heard of it...but its the same high price again. This guy was selling pieces already taken out of the spiky shell though, so we bought some for $40 HK. THEY WERE HARD AND SOUR. AND HE SAID THEY WERE SUPPOSED TO BE LIKE THAT. He said that the golden pillow variety is supposed to be eaten while still hard. Ive never heard of this, and frankly if durian was this way always, I would never eat it. and we filmed for 40 seconds. People start looking, and the vendor notices and runs up and grabs the durian out of my hands saying that Im disrupting his business. if I were selling something...nothing but good exposure. I think it would have tempted someone to buy a durian that day. Watch the video on youtube here...sorry for the crappy quality everyone...Im getting a good camera soon. I just use my little digital camera to film right now. Ive posted alot of new vids though, so be sure to check some of them out. So I pissed off two vendors in one day...oh well. My heavens...can it be true? People sailed the seas just to taste the durian, I can do a three hour flight. Read more about the Sabah Cuisine HERE...I really hope to go...seems like a sure bet. Someone brought up the styrofoam issue....how some of my pics have me with styrofoam. "Can I order a dragonfruit juice please?" The girl behind the counter makes the juice...I sit down at a table. She walked over and gives me the dragonfruit juice. I get the dragonfruit juice in a styrofoam cup. What do I do now? Throw it away? It just boggles my mind how people dont think about this before they type something to me. Its like they look for anything to shoot someone down. If you come to my apt and I give you something in styrofoam, then you have every right to complain. Do you think I would ever buy styrofoam? I drink out of wooden cups at home. If you order durian and dont bring your own package with you, they give it to you in whatever package they happen to have. You dont really have much say, especially if you dont speak Khmer or Cantonese. Stupid assumptions really perplex me. Our civilization is going to change drastically because of peak oil and climate change and people are still thinking about styrofoam. We are WAY past that stuff. Of course we shouldn't use it, but focus on something more imminent. Like the boy scouts say...BE PREPARED. Just wondering where d'you get your wooden cups from? Anthony, I just wanted to let you know that I wasn't trying to "shoot you down" with the storofoam question. You have never mentioned anything about the issue so I simply wanted to know your thoughts. I am a regular reader of your blog and a supporter of what you are doing and did not mean to conjure up any negative feelings. Enjoy the rest of your vacation.